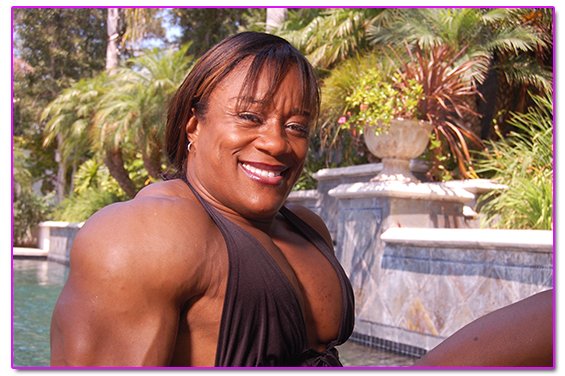 Welcome to the Profile Page of the very muscular & attractive IFBB Professional Bodybuilder KIM PEREZ! Where and when were you born? I was born in Sandford North Carolina May 17, 1970. Were you involved in sports or fitness prior to bodybuilding and how did you get started with weight training? I started Gymnastics and Ballet at the age of 9. At the age of 12 I started running Track and played Basketball. When I started high school, I continued to run track and also joined the Cross Country Team. I received a Track and Cheerleading Scholarship. Moved to Oklahoma City started modeling for three years. I started lifting weights joined the AAPF (American Amateur Powerlifting Federation) for 5-6 years. I won the World Championship and wanted something more, I then started bodybuilding 3 years ago. I grew up with two brothers and my mom bodybuild when I was younger..so I would say bodybuilding is in the family. Was it a goal for you to compete in bodybuilding competitions right from the begining or was it something that grew in your mind as time went on and you saw the progress in your body? I never imagine me doing bodybuilding, It has always been around me my entire life. People would tell me all the time that I should be a bodybuilder , but I did not see what they were seeing. After I exceeded my goal in Powerlifting I told myself I would do only one Bodybuilding show. I did one show and loved it every since. Can you give your competition history? Which contest has been your biggest success; which has had the most meaning to you? I can't pick just one show..All have been a success. I take my placing and try to improve my physic for every show. Every show I prepare for has meaning to me. The hard training, dedication, diet, scarifice, and determination will always play a big role when I do a show. Please tell me something about your training routine; I train 6 days a week for 1 1/2 to 2 hours. Offseason I do cardio 3 days a week for 45 min. What is your favorite execerise in the gym and which one you don't like so much? My favorite exercise is Bench Press, I love working out, I really don't have one I dislike. Which body part is your best in your opinion? I think my best body part are my shoulders. What do you enjoy about training for a competition....what do you enjoy about the offseason? When I get ready for a competition I think I really enjoy the transformation my body goes throu. Offseason I enjoy putting on the bulk. What I do to relax is watch T.V and spend time with family when I can..
What do you enjoy most about the bodybuilding/fitness lifestyle? To be honest this is all know..lifting weights is my life...I really love all the support from freinds,fans and family. This year I will compete at the Europa Super Show in August. Kim does not do sessions or wrestling of any kind. Please don't ask!! Kim Perez ~ Buy Kim's new DVD on Amazon!